If you have an e-commerce business, it’s important that you have a Google Shopping strategy. Google shopping is powered by Adwords and Google Merchant Centre. However, unlike Adwords where text ads, campaigns and ad groups are focused around keywords of your choice, with Google Shopping, Google determines when your ads show up. This makes it closer to natural search, and as an SEO marketer, it’s your job to make Google think your ad is the most relevant one for the user’s search query. I’ve underlined titles in red. Here’s the longer description, also underlined in red. Sidenote: if anyone wants to buy me these Kitty Flats, I’m a size 7 thanks. How long should my Google Shopping ad title be? There’s not a lot of space to play with when it comes to Google Shopping titles. Google Merchant Centre lets you submit titles up to 150 characters but advises keeping the title character limit to around 70 as this is the maximum amount they display. You can see that some of the examples above have ignored this rule and have been truncated, which looks a little messy. Stick to around 65 characters. How long should my Google Shopping ad description be? Descriptions obviously have a little more wiggle room that titles. Google allows up to 5000 characters for product descriptions, but let’s be honest, the majority of people won’t read it a description that long. It’s advised that you keep your product descriptions between 500 and 1000 characters long, with the most important information coming first. What information should my Google Shopping description include? Not all of these will be applicable to your product, but try to include as much relevant information as you can. 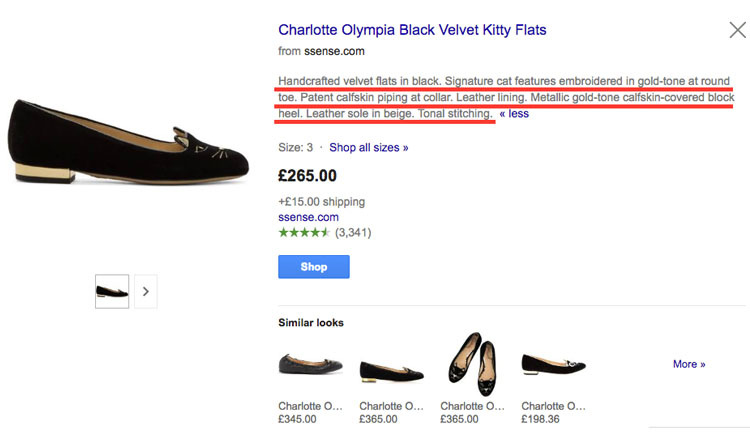 Can I use keywords to optimise my Google Shopping ads? If you have a short title, try to make the most of your character count by adding some keywords to it. Here, we’ve just added some relevant information to the title (but still keeping it under 70 characters). If you want your product to rank for a specific term, for example ‘suede flats’ make sure you include it in the product title, and not just in the description. However, research suggests that Google’s algorithm sees the words at the beginning of the product title as the most important factor when it selects which ads are most relevant for the search query, so make sure you put the search term you most want to rank for, first. Is there anything I should avoid in my ad description? Google has certain requirements and guidelines when it comes to writing shopping ads – but it also has things that it does not recommend. 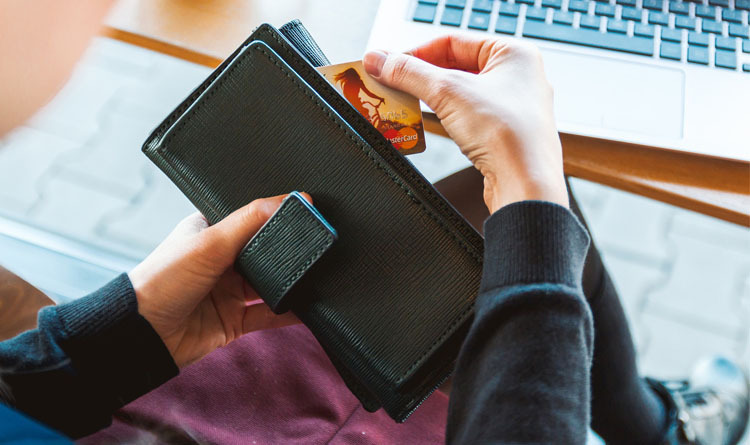 It’s important that you take these into account when writing your shopping ads, as Google will penalise rule breakers. Here’s what you shouldn’t include in your description. Block capitals or special characters – they look gimmicky and are a technique often used in spammy ads. Foreign words – unless they are commonly understood. For example, the word ‘ramen’ is widely used outside Japan. Promotional text – such as sale price, sale dates, delivery, delivery dates or other time-related information. In addition to this, it’s important that you use correct grammar and spellings as it not only looks more professional but is also something that Google rewards. 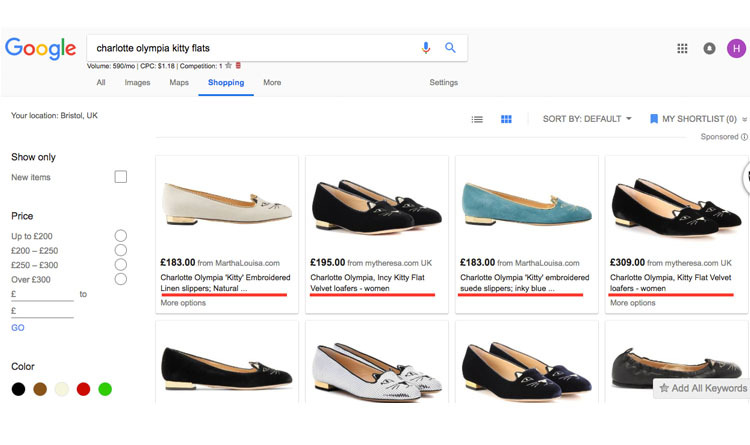 By following Googles guidelines and writing clear, concise, optimised titles and descriptions, you will have a greater chance of featuring more prominently on Google Shopping. However, it’s important that you also focus on creating enticing product descriptions so that customers convert once they actually get to your product page.